Linda Vonderschmidt-LaStella (claysongs.com) was the lead artist on OX POWER. Her work is primarily in sculptural tiles and ceramic murals. A resident of Metuchen, NJ, Linda is a full-time ceramic artist working at Earthsongs Ceramic Studio since 1993. She earned her Bachelor of Arts in English from Neumann College in Aston, PA, and her MFA in Ceramics and Painting from The Catholic University of America in Washington, DC. A recent major project is a two-part mural permanently installed in the dining area at the new Capital Health Hospital in Hopewell. 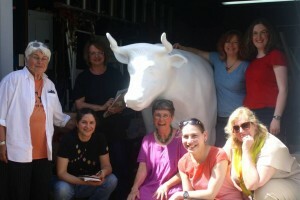 Eight additional women artists collaborated on "Ox Power"